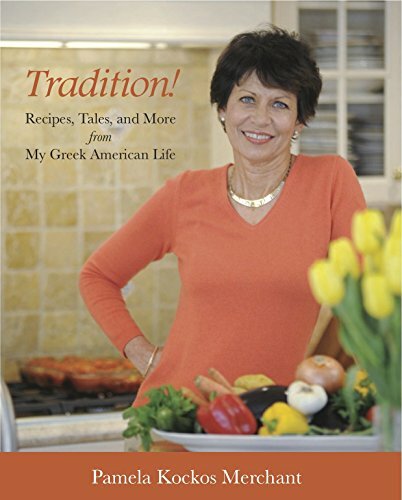 In this Greek food cookbook, Pam shares her personal collection of traditional, home-cooked Greek and American recipes; heartwarming memories; and an array of beautiful photos that together define her lifelong adventure with food. Throughout, she pays tribute to her mother, the one who inspired her passion and appreciation for what she values most: Greek culture, food, friends, and family. Ninety-five easy recipes record this journey from Appetizers, Soups, Salads, and Breads to Fish and Poultry, Meat, and Sweets with an emphasis on simple, healthy vegetarian recipes. Delight in Greek dishes like tender, succulent Lamb and Vegetable Stew braised in garlic, onion, and white wine; the creamy lusciousness of Custard with Phyllo and Syrup; or the savory goodness of Baked Lima Bean and Tomato casserole cooked with olive oil, tomatoes, and parsley. Additionally, be enticed by some American classics such as the sweet aroma of warm Cinnamon Coffee Cake; the tomatoey, meaty pleasure of Pam's special Chili; or the piquant, citrusy flavor of Crazy Lemon Cake. Accompanied by a food memoir in the introduction of many of the recipes, Tradition! promises to inspire and entertain. Also included are these sections: The Be-Attitudes of Cooking, where the real secrets behind every successful dish are revealed; Being At-Ease with Phyllo Dough, and; A Walk Through the Year: Your Seasonal Produce Guide. Sprinkled with beautiful photos from her travels to Greece, Tradition! is more than a cookbook. It's an exploration into a Greek American life.